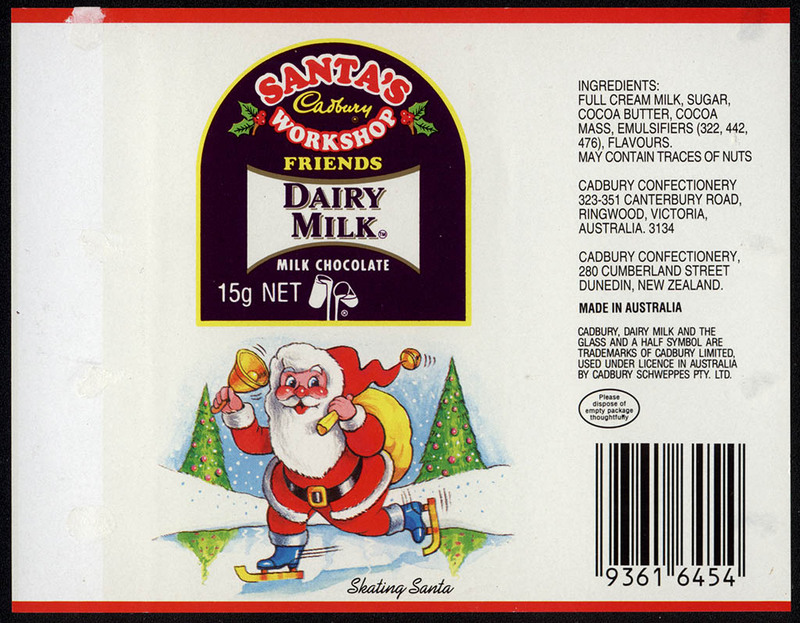 ← Christmas Countdown: Beich’s Classic Santa Claus Candy and More! Christmas Countdown: Cadbury’s Santa’s Workshop Dairy Milk – From New Zealand! It’s Christmas Eve and here at my mother’s house that means we are preparing things in anticipation of our big Christmas Eve dinner. I’ve temporarily cleared a place at the dinner table to write today’s post before everyone arrives, and the smell of home-baked bread is delightfully filling the air. 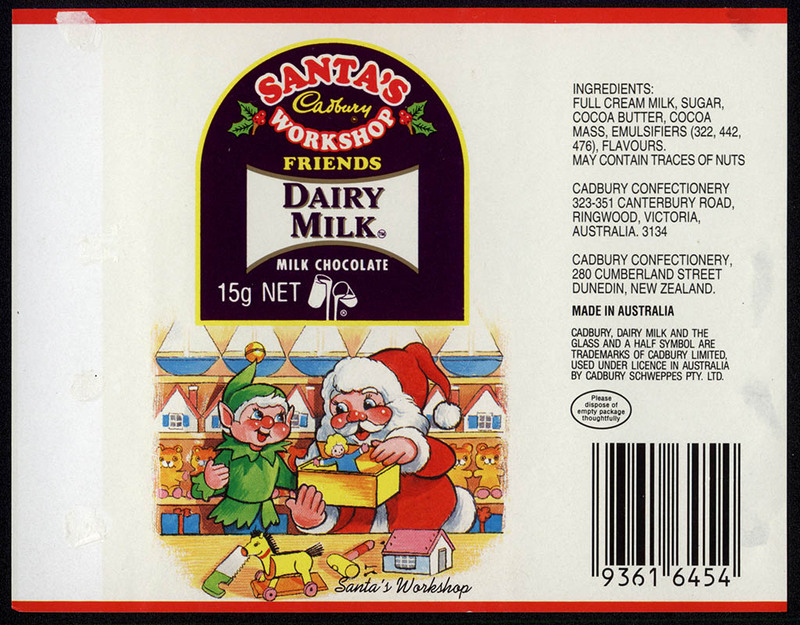 For today’s post, I’m going to share a set of Christmas-themed Dairy Milk wrappers from my collection that were released by Cadbury’s New Zealand branch in the 1990’s. They feature fun Christmastown scenes like Rudi Reindeer and a Skating Santa. That’s the whole set of six wrappers! I’ve got to run as family is about to arrive and I need to clear my laptop from the dinner table. 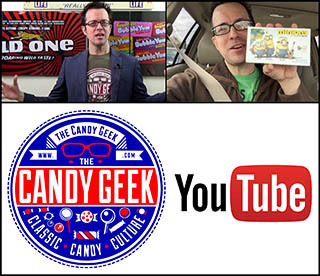 So from to all of my visitors who celebrate the holiday: Merry Christmas from CollectingCandy.com!! 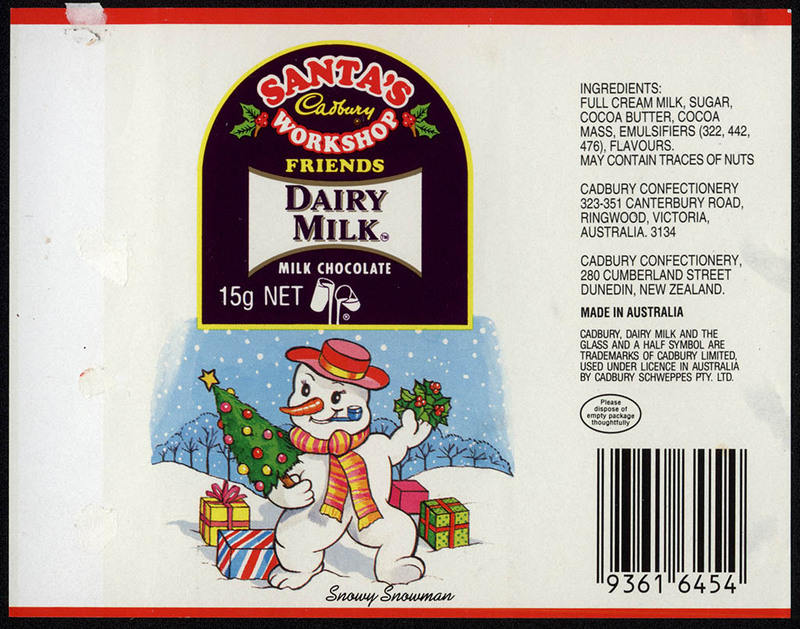 This entry was posted in 1990's, Cadbury, Christmas, Holiday and tagged Australia, Cadbury, candy collecting, candy collection, candy collector, candy wrapper collection, candy wrapper collector, Christmas, Christmas candy wrappers, collectible, collecting candy, confectionery, confections, holiday, New Zealand, packaging, sweets, vintage candy wrapper, wrapper. Bookmark the permalink. 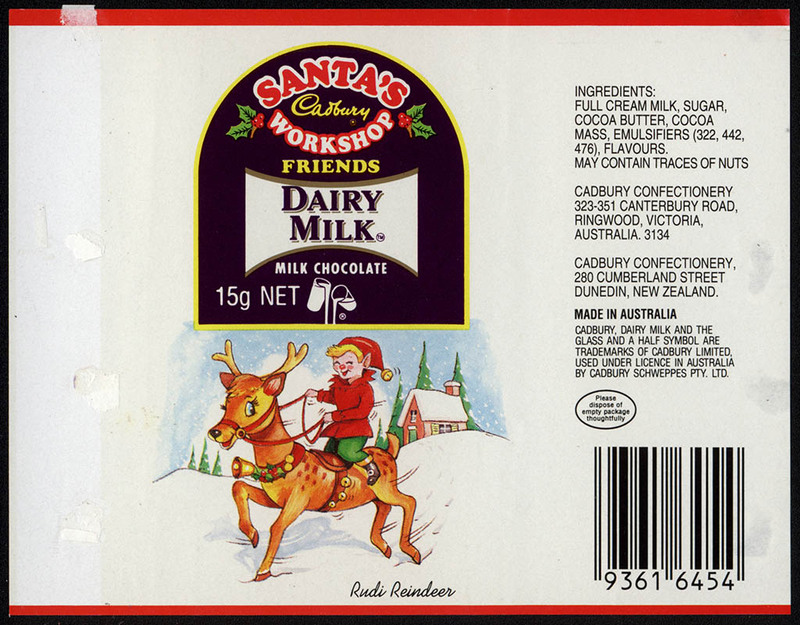 3 Responses to Christmas Countdown: Cadbury’s Santa’s Workshop Dairy Milk – From New Zealand! 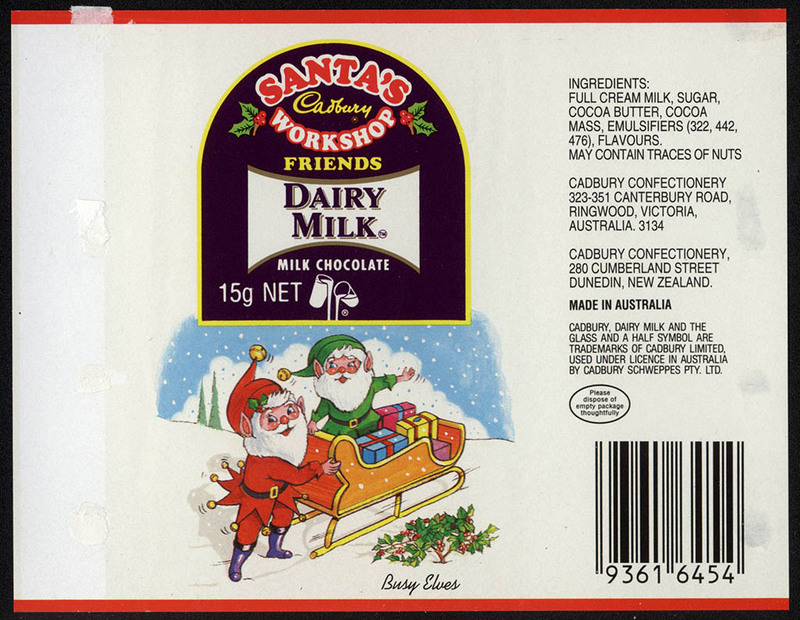 Afew years back ‘Cadbury’ put up a wrapper on their family blocks with Christmas stories on them. One in particular was about the angel and drummer boy and their placement on the Christmas tree. I have been searching the web ever since and can’t locate this story. Would you know of it? Clutching at straws here! Thanks and have a great day. It doesn’t ring any bells, but I have a LOT of Cadbury Christmas wrappers from over the years. Do you know around what year you saw this wrapper? Thankyou for the quick reply. I live in Australia and it was 2009 or 2010 I thonk.